This project formed part of the Cadw pan-Wales assessment of prehistoric defended enclosures. The survey was designed to provide up to date information about the character, value and condition of such sites across the whole of Wales in a common format. In north-west Wales this was carried out over two seasons of work and comprised about 120 known prehistoric defended enclosures of which 61 were Scheduled Ancient Monuments. Only one in four of the latter were to be visited because these are already well-known and protected monuments. The first year was in west Conwy, north Gwynedd (Arfon District) and Anglesey and was completed in March 2005. The second year, 2005-6, comprised visits to sites in west Gwynedd (Dwyfor District) and Meirionnydd. In 2006-7 a programme of field assessment was carried out of a group of lightly defended enclosures with closely set bivallate defences on the Llŷn Peninsula. These enclosures are all situated on low hill-tops within lowland areas. They survive mainly as very low earthworks or as crop-marks. In terms of form they resemble the scheduled hillfort of Castell Odo, Aberdaron, which has origins in the later Bronze Age. The suggestion was that these enclosures might be of greater value than their above ground appearance suggested. The field assessment was designed as a programme of assessment by geophysical survey, carried out by David Hopewell, of six non-scheduled, defended enclosures. Six enclosures were chosen in Llŷn of which two proved to be on bedrock unsuitable for geophysical survey. Two other enclosures of very similar type and situation on Anglesey were therefore chosen, one of which was a scheduled site of which the defences survived as earthworks but of which nothing was known of the interior. Five of the surveys proved to be informative with only one, that of Castell Caeron, Llŷn, producing poor results, because of the rocky nature of its location. 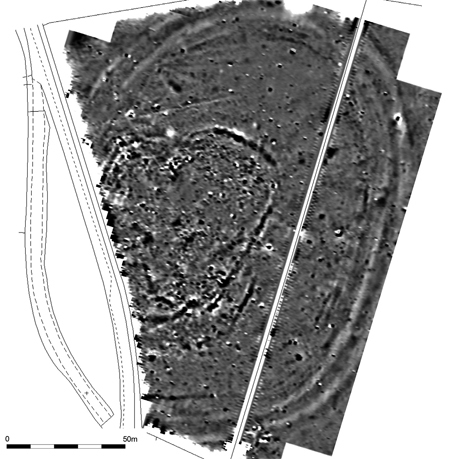 Good evidence of settlement, in the form of roundhouses was found at three enclosures and evidence of multi-phase use at three sites. One of these, the site of Werthyr, Bryngwran, Anglesey, included a previously unsuspected smaller defended rectilinear enclosure within the main hillfort. The latter with upstanding ramparts is already scheduled but the other five survive mainly as crop-marks or very low earthworks and are not scheduled.